It was the top match of this game day in Italy. The currently best team Napoli faced at home Inter Milan who started the season pretty well. Both teams were undefeated before the game. Napoli played under the week in Manchester while Inters players could rest the whole week. In the end, Napoli was the better team but couldn´t manage to bang one in. Maurizio Sarri lined his team up in their typical 4-3-3. Compared to the starting eleven in Manchester Sarri changed to positions. Jorginho and Allan came back after they got rested against City. Diawara and Zielinski had to sit on the bench instead. In Goal played the former Bayern and Liverpool keeper Pepe Reina. In front of him, Raul Albiol and Koulibaly took charge of the middle. Ghoulam supported the strong left side from Napoli while Hysaj positioned deeper at the right full back position. In Napolis three-man midfield Jorginho played as the deep lying playmaker. In front of him Hamsik and Allan both supported the offence. Hamsik regularly occupied the left half space. With him and Insigne who played as the left winger, Napoli has a strong left side. That’s why most of their attacking plays take place on the left side. Callejon officially played on the right side. Normally he pushes in the right half space or the middle to hold the connection to the rest of the squad. Against Inter he played exactly that role as an inverted winger. The striker position was filled with Dries Mertens, last year the Belgian was moved in the center due to injuries and played an impressive season. Before the following season Sarri did not change anything and as well as last season Dries Mertens is the perfect fit for Napoli in the middle because of his ability to participate in the combination play. Furthermore, With Mertens and Insigne Napoli has two very fast attacking players who easily win running duels. So, Napoli´s midfielders often look for the throughball behind the lines to bring Mertens in position. Luciano Spalletti who won last year with As Roma in Napoli lined-up his team in a 4-2-3-1. In defense, the system switched to a 4-4-1-1. With Icardi up-front and Borja Valero behind him. The two wingers who were important for counter attacking situations were Ivan Perisic and Italian national player Candreva. In the middle Vecino and Gagliardini tried to close down Napoli´s attacking force. In defence, Spalletti decided to go with a back-four which played asymmetrically. The left full-back was Nagatomo who gave Inters game width and pushed higher in possession. On the right-side, D´Ambrosio played more like an additional centre back. Rarely he supported Candreva only on a few occasions in the first half. With him and the centre-backs Miranda and Skriniar he built an asymmetrical back-three. The key to winning against Napoli this season is clearly to defend on the highest level. Inter was great in making the available space for Napoli as small as possible. In the first half, Inter was very compact in their 4-4-1-1. Icardi´s had a more passive role in Spalletti´s concept. Only when they pressed higher he aggressively took part in Inters defensive work. The Argentine striker had clearly no chance to win the ball when Napoli was in Inters half, therefore the structure of Napoli in possession is too good. Behind Icardi the work ethic of Valero was much more important. He was the guy who should close down Napoli´s midfielder especially Jorginho. Furthermore, Valero was responsible to cut passing lines in the space between Inters defence and their midfielders. Vecino and Gagliardini defended one line behind Valero. The two central midfielders along with Candreva and Perisic shifted very well and were able to stop or slow down most of Napoli´s attacks. Against Napoli it is important to deny open passing line in the middle or halfspace. Napoli prefers to attack down the left side. With Insigne, Hamsik and Ghoulam they have players who are very skilled under pressure, have great vision and first touch. Spalletti, therefore, had to find a concept against the dangerous left side. As I mentioned above, Inter shifted quickly from side to side, they communicated well and were very compact. If Napoli started their attacks from the left side, Inter closed down the space very aggressively. Besides D´Ambrosio and Candreva the central midfielders and Valero helped to stop those attacks. The scene above is a perfect example for Inter discipline defensive efforts. Valero helped to close the gap in front of the midfield. Gagliardini shifted to the side to support Candreva and D´Ambrosio. Napoli stuck on the wing without access to the centre in this situation. In the end, Hamsik crossed the ball in which was easy to defend for Inter due to the size of Mertens and Callejon. The position of Valero in this situation and in general was really important. If he would stay higher Ghoulam had space to operate and Napoli could pass the ball in the box to Mertens or start a new attack with access to the centre. Besides, many teams got pushed back from Napoli´s attacks so the left half space is open, normally Hamsik can take advantage of that and other teams struggled to defend the captain if he was able to touch the ball with a clear view to the opponent. Nevertheless, Valeros true task was to stop Jorginhos from moving the ball around and creating passing connections between Napoli´s right and left-side. Another point why Inter could stop so many attacks was their ability to prevent Napoli´s players from turning as well as getting a clear view to Inter´s goal by using the play with the third man. Both things Inter defended aggressively without getting out of position. Between the lines rarely was space and the midfielders and defenders timed their movement out of the line perfectly. Here again good example how little space was available for Napoli between the lines. In this situation, Koulibaly could play the ball to Insigne who was able to turn but his pass to Hamsik was defended perfectly by Skriniar, so Napoli had to start another attack. Because of the tight defence Napoli rarely could play through the ten-space and behind the lines which is their common game plan. Napoli had only a few chances in the game not only because of Inter´s defence but because of their own issues in possession. Napoli seemed to be tired which is natural because of their game against City. Sarri rotated not so much, so a lot of players played all games through the last weeks. Because of that Napoli´s players didn´t play the game with the highest speed. They rarely were able to move the ball so quickly like in the last weeks to break down Inters defence consistently. Again Napoli´s left side was the dominant one. Especially at the beginning they often tried to play through the left halfspace but Insigne as well as Hamsik both had a quiet game and couldn’t establish their recent form. Surprisingly Napoli´s passing was not that accurate compared to other games this season in which Napoli pretty comfortable even in tight spaces. Normally Napoli quickly creates triangles after switches on the left side. With Hamsik, Ghoulam, Insigne and Mertens they can then attack the ten-space or the room between the defenders. Against Inter, Napoli used that as well but because of the lack of speed, Inter had enough time to close the available space for Napoli and therefore a lot of attacks ended between the lines of Inter where they could intercept the combinations or Napoli had to start another attack. Due to their heavy concentration on the left wing with Callejon pushing in the middle and Hysaj who stayed deeper, Napoli sometimes could only play through the left wing. Inter could shift to the left side and be compact because no one gave the Napoli play the necessary wide on the right wing. Along with their structural and tempo issues Napoli didn´t develop enough power to create a ton of chances. Rarely Napoli switched the play quick enough to the right-side to develop dangerous situations for Inter. But when they played it quickly not only the switch but also the combinations, Inter got problems with defending. One of Napolis better chances in the second half resulted from a good switch with a fast combination between Hysaj and Callejon. In the end, Callejon passed the ball into Mertens who could get it on goal. Inter didn´t only wait for the counter attack. Especially in the first half, the Milan team was capable of breaking Napoli´s pressing and then creating some good opportunities to attack. In the end, Inter was not able to create a lot of big chances due to Napoli´s strong defence in their own third but nevertheless, Inter showed why they are part of the top teams this season in Italy. They regularly built-up with a 4-3-3/4-2-3-1. Nagatomo pushed higher as I mentioned above to support Perisic while D´Ambrosio helped to create a strong structure against Napoli´s aggressive pressing. Therefore, Candreva stayed wider on the right-side in order to offer D´Ambrosio a passing option on the wing. In the center, Inter positioned in a 1-2 line-up. Gagliardini constructed a triangle with the center-backs while Valero and Vecino occupied the higher positions. Borja Valero for example played in the ten-space. In order to help Inters defence, they could drop deeper. Mauro Icardi was the passing option when Inter tried to play long balls but they quickly understand that Icardi rarely had a chance to hold the ball and wait for his teammates to help him. Often Jorginho, Albiol and Koulibaly regained the ball easily. However, when Inter played out from the back with shorter combinations they were able to find space behind Napoli´s midfielders in which Icardi could drop or Valero and Vecino occupied that space. Inters defenders reacted calmly to situations in which Napoli pressed higher. But in the end, Napoli´s pressing was good enough to stop most of Inters attacks. Napoli pressed in their typical 4-5-1/4-3-3 which could switch into a 4-4-2 when one of the central midfielders joined Mertens in the front line. In the centre, Napoli had clear orientations towards the opposing midfielders and followed them when they dropped deeper. Especially when Valero supported Inters back-four Jorginho left his position in front of the back-four and joined the high-pressing block of Napoli. On those few occasions, Inter could find space behind Napoli´s pressing block. The other more dangerous situations from Inter resulted in fast vertical plays and the few counter attacks Napoli allowed them. Napoli was really compact closed down all passing options and aggressively overload the ball near space. A perfect example of Napoli´s pressing. Allan pushed higher to support Mertens who cut down passing lines to either the center back or the goalkeeper. Allan pressed Miranda while Callejon followed Nagatomo and Jorginho Gagliardini. Inter got isolated on the left wing and the situation resulted in a turnover and possession for Napoli. Along with their pressing and counter-pressing Napoli was able to defend all attacking efforts of Inter. Especially during the last 15 minutes of the first half and most of the second half, Inter couldn´t free themselves up from Napoli´s pressing. The team from Maurizio Sarri pushed Inter deeper in their own half and therefore dominated the game without scoring a goal in the end. In the end, the game ended with a draw. 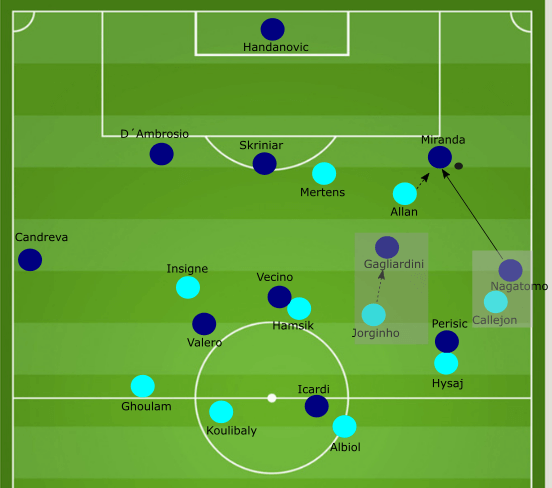 Napoli was the dominant team, because of their strongly connected structure in possession they could counter-press quickly and deny most counter attacks. Inter played discipline defensively. The few chances Napoli got were saved by Handanovic in goal. Napoli seemed to be tired. Insigne, Hamsik and Mertens had not their best days, especially Insigne seemed unlucky. Napoli´s offensive game lacked the necessary speed and precision of passing and positioning. In the end, both teams are still undefeated and now have to prepare for the upcoming weeks.